Buzzbeeper is a simple, easy-to-use, low-cost cloud-based service that gives your customers a fun, 10-second survey to find out how you’re doing (via text message, twitter, or telephone). And when a customer isn’t happy, it “beeps” you before they even leave the store so you can fix the issue on the spot. Plus an integrated social network referral system. Plus coupons. Plus text message campaigns. Some very exciting “beta site” deployments suggest this is a real “game changer” for retail businesses. Buzzbeeper is a new cloud-based telephony app built upon Heroku, Amazon AWS, Twilio, and Tropo. Sometimes I bring a thermos of chai to yoga class (or meetings). 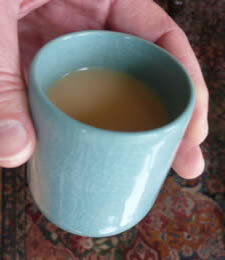 According to my scientific guesstimates, drinking one cup of chai is equivalent to 23.4 sun salutations. Here’s my recipe that makes 8 cups. Bring to a light boil, cover, simmer on lowest setting for 4 hours or more (I do 6 hours). Add 8 TSP good loose tea (I use half green jasmine and half black assam). Simmer covered (still lowest setting) 60 minutes. Stir once or twice. Simmered so long, the tea itself will be slightly bitter, which nicely (and authentically) offsets the spices and the honey and milk. Add 1 cup cold whole milk. Simmer (lowest setting) covered another 20-30 minutes. Stir once or twice. Turn off heat. Add 1/2 cup honey. Use the good stuff. Stir in. Taste. Add a little more milk and/or honey to taste. It needs to be sweet… experiment with adding even a little more honey to a cup of chai and find out for yourself what the “sweet spot” is. Pour through strainer into glass jar. Serve and enjoy. Stays great for 5 days or more if you refrigerate it promptly. Easy to reheat, or, on a hot day enjoy over ice. A friend needed some help adding SSL to their custom-domain-name app hosted at Heroku, and it wasn’t entirely trivial. We found bits and pieces in several places, but never found clear and complete instructions. This wizard worked fine and has clear directions on what goes into each field. However, you’ll need to change their default country code from “us” to “USA” the lowercase ‘us’ isn’t correct. Click Generate. That creates the Unix command needed to generate the CSR. “cd” to whatever directory you want to save your keys in. We put them in the “allmyapps” parent directory of the Heroku app. Copy the command and paste it onto the command line of your unix shell (we used Mac terminal). It looks something like openssl req -new -newkey rsa:2048 -nodes -out myapp_mydomain_com.csr -keyout myapp_mydomain_com.key -subj "/C=US /ST=Washington /L=Spokane /O=myco inc /CN=myapp.mydomain.com"
Note: Heroku won’t let you have a passphrase in your key file, so don’t add one. Using the command shown, we weren’t prompted for one, so it wasn’t a problem. I have seen blogs that refer to removing the passphrase. Go to cheapssls.com [ we discovered cheapssls.com resells rapidssl certs at a fraction of the price] and click the button to get a single-domain certificate and choose the rapidssl option for under $10. Select “one year” assuming that’s what you want. Click Continue. Paste the .csr file you created/copied to your clipboard in steps 3/4 into the big text box and click Continue. The website will parse the CSR file and display the information encoded in it… be sure you have the domain name right, etc., then click Continue. Fill out your admin/tech/billing contact info, which unless you’re doing this for a corporation will likely be you in all three cases. Complete the order process on rapidssl.com. It includes entering a phone number so their automated system can call you to confirm you draw breath. The onscreen instructions are simple. The order process takes maybe a minute or two. They will give you a list of possible email addresses to send your certificate, receipt, etc. One of them should already work for you (the email contact for the domain name), if not, you have to create a new email address and get it working BEFORE you go any further. In our case, we had to go to Godaddy and create a postmaster@mydomain.com forwarding address since we could not get email at any of the choice listed. After 49 minutes (in our case) rapidssl.com emailed our certificate. Two actually… one is a ‘chain’ certificate which we deal with soon. (e) press control-D to terminate the file. Verify it: At the command prompt type cat myapp_mydomain_com.crt (NO > this time) and verify the file got created correctly. There is NO step #13. It’s bad luck. Now, finally, you get to use the heroku gem to schlep the key etc over to your heroku app. That means (which I never saw documented) you need to cd into the directory with your heroku app. In our case that’s one directory “down” from where we’ve been working… which measn onc ein that directory when we refer to the .key or .pem file we need ot point ‘up’ 1 directory… In your case, adjust the path to the .key and .pem files according to where you store them. Since the CNAME already existed in his DNS, we edited it, changing it form proxy.heroku.com to the long domainname they specified. FINAL TIP: you may need to reboot your PC (or flush your dns cache) for your PC to “see” the new DNS settings because the old settings (proxy.heroku.com) are probably cached on your PC. On a Mac OSX 10.5 you’d typedscacheutil -flushcache then type host myapp.mydomain.com to see if the DNS changes have taken effect. Someday we may fail to find the images we need on istockphoto. But not today. Revised: yet another great service ruined by corporate greed… dramatically higher prices, confusing credits. Huge selection of photo and vector art, good search/lightbox capability, ~~low cost~~, essentially unlimited use (for many purposes), ~~easy pay ‘n download~~. My favorite feature? Ability to download reasonably clean watermarked comps so we can play around with storyboards and mock-ups until we decide exactly which ones to use. Author pardnerPosted on April 19, 2011 Tags greed, istockphoto, stock vector artworkLeave a comment on Someday we may fail to find the images we need on istockphoto. But not today. Last year we did a pretty cool “local O2O” (Online-to-Offline) project with a local TV station. The budget and timeframe were tight. And this project simply *begged *to be done with Ruby on Rails for a host of reasons. We came in on-time, on-budget, with an exceptional end result after using elance.com to find a team in India. A full database schema. A fuzzy idea of the database, and/or turning the schema design over to anyone who’s not proven to be exceptional at it, is a train wreck. I repeatedly heard from good developers that a well-designed database lets them bid one-third to one-half of what it would cost otherwise. Take the money you’ll save and invest it in the schema design. **Mock up screens. **You can not rely upon text, you have to show the fields, the buttons, etc. (It’ll help solidify your thinking, too.) Let me say this. The only three spots where we ran into ambiguity issues were the three places where we played a little loose on the sample screens, thinking it was “obvious” what those screens would look like. Spec the environment. If it has to run on Heroku, make that clear. Include 2 or 3 major “gotchas”. Purposefully put at least 2 or 3 things into your spec that don’t make a lot of sense or contradict other elements of the spec. See who catches that. It’s instructive in picking a development team. As a trivial example, suppose part of your spec you’re going to run at Heroku. Put some aspect in your spec about storing files in some folder on the website. If they know their stuff they’ll immediately point out Heroku has no local file system, that you’ll probably want to push files over to S3. It’s a fair test IMO, because those sort of gotchas will happen anyway, so you’re entitled to ‘test’ developer’s ability to catch them before they spend you money writing code that won’t work. Daily involvement. Generally, the closer you can come to full time co-involvement, the better the results. We setup a testing tag-team to test every feature as it was implemented, and actually designed the spec for incremental development and testing. Spec comments and readability. I’m all about comments (lots) and code clarity (not using every cool shortcut the language offers, favoring understandability by humans over saving a few CPU cycles.) I provide examples of obtuse but fun little shortcuts that I don’t want to see, and the old fashioned way I do want to see it done instead. If I really wanted uber-dense tight code I’d go back to doing it all in APL or Forth. What I want is code anyone can look at and understand months from now. Git / github. If you aren’t using it, do. **Daily code review. **Review code as it’s checked in. Catch bad habits early. Obviously that’s the tip of the iceberg, but those simple tidbits saves us a lot of time and hassle. Author pardnerPosted on April 17, 2011 Tags VoxeoLeave a comment on IMO Tropo not ready for prime time. Went with Twilio.